Gourmet cookies are freshly baked using only the finest premium ingredients like Belgian chocolate and fine cake flour. Presented in a vibrant two-box tower, it's a sweet gesture for any occasion. 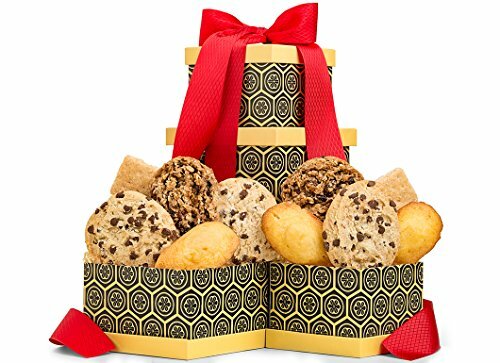 Included in this Gift: Chocolate Chip Cookies, French Butter Madeline Cookies, Heritage Shortbread Cookies, and Oatmeal Raisin Cookies. What's Inside - Chocolate Chunk Cookies, Maple Leaf Cookies, French Butter Madeline Cookies, and Soft Cranberry Oatmeal Cookies. Best Sweets Gift - Gourmet cookies are freshly baked using only the finest premium ingredients like Belgian chocolate and fine cake flour. Presented in a vibrant two-box tower, it's a sweet gesture for any occasion. Your gift will leave a lasting impression as they repurpose and enjoy these exclusive keepsake boxes, stacked together to make a tower. Presentation - Each cookie is individually wrapped for freshness, and the tower is accentuated with a hand-tied satin ribbon. Complimentary scissors are included so your recipient can easily open their gift, as well as a free card with your personal message or greeting. Gift Dimensions - Measures 6" x 5" x 5".